Newly completed 15,600 sq. ft. building in the Avenida Guadalupe business district. Large modern extruded aluminum framed windows and enhanced design features make this an excellent choice for corporate offices. Currently availability offers a beautifully finished-out and furnished second floor office space and one first floor shell ready for your design averaging about 3,000 sq. ft.
La Promesa provides a wide range of possible uses for businesses in a surrounding growing commercial environment very close to downtown. 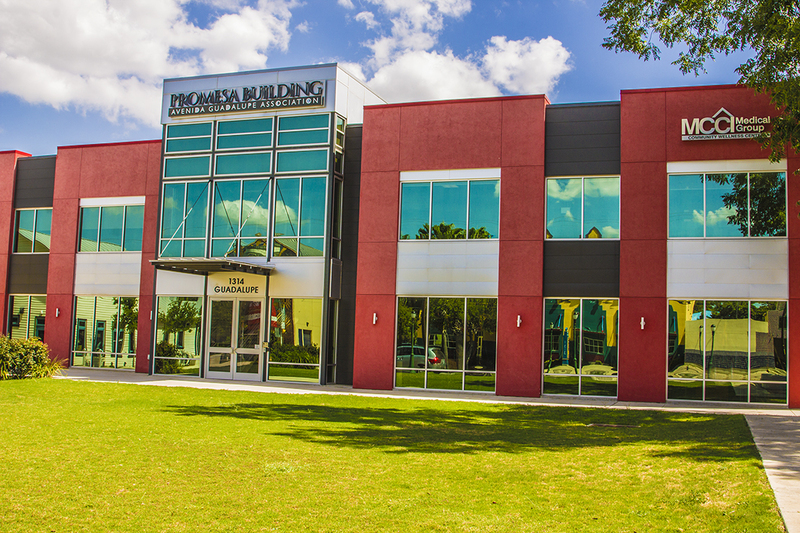 The Promesa Building is a component an economic development strategy to continue revitalization efforts in the Avenida Guadalupe business district made possible with support from the United States Economic Development Agency and the Office of Community Service, the City of San Antonio, and the RAZA Development Fund. In 2014 the Promesa building received a Wells Fargo UrbanLIFT Grant which funded design enhancements to the east and west exterior staircases featuring art from Chicano Art era artist Jesus “Chista” Cantu (a founder of the famed Con Safo art movement of the 1960’s) titled, “Why do I have to go to the moon when I came from the Sun”. Each of two art pieces is laser cut into stainless steel and measures approximately 8 x 30 feet tall. UrbanLIFT is administered by NeighborWorks America® and is designed to provide support to local nonprofits for neighborhood revitalization projects in 25 MSAs with diverse populations that were impacted by foreclosures.